Once upon a time I was a high school American Literature teacher who believed in the survey method of “these are the canonical works that all students should read before they leave high school.” I spent years patting myself on the back for getting struggling readers to love The Crucible, Of Mice and Men, and The Great Gatsby. We read them all together and talked them through and loved them. So why didn’t they read the short stories and essays I assigned them for homework? Why did they leave “The Pit and the Pendulum” in their locker, but ask me not to stop reading it if we did it together? I figured it was lack of motivation. Then I switched to teaching British Literature. It was the first time in a long time I looked at a new set of required texts that I would be teaching including Beowulf, Macbeth, Frankenstein, and 1984. I excitedly began the year with Beowulf–reading it aloud with my students. They were totally into it, but again when I assigned portions for them to read and annotate on their own, they just didn’t do it. It was sometime during Macbeth that I realized, my students either A) couldn’t read the texts on their own or B) they didn’t relate to any of it. They didn’t care. They couldn’t relate to what I was putting in front of them. My students are urban, Title 1 students. I started getting downhearted about handing them Frankenstein, a book I know I should have them read on their own. These students didn’t want to read anything that teachers had been handing them for at least four years. While some were intrigued about a story about a mad scientist creating a monster, after the first chapter they were done with it, lost in the dark over-description of the dark romantic writers. My students need to be able to have choice in what they read or they simply won’t read; they will suffer word poverty and ultimately illiteracy. In their book Reading Unbound: Why Kids Need to Read What They Want–And Why We Should Let Them, Jeffrey D. Wilhelm and Michael K. Smith postulate that “over the [next] ten years, the average literacy required for all American occupations is projected to rise by 14%” and that “literacy is an essential element of cultural success” (7). It’s been proven over and over that children who are read to and are around parents who read have a greater success rate in school and beyond than children who do not. Data would also support that families with higher degrees typically have more books in them than families who have only a high school diploma or less. It doesn’t take much to connect the dots that children who are being brought up in lower socioeconomic households are the children who are more likely to be illiterate. It is also not a large jump to realize that the majority of those students are children of color. Wilhelm and Smith also state clearly that “students are not going to become lifelong readers if they don’t find pleasure in reading”. Students need three things to be able to find pleasure in reading: ability, a positive attitude about reading, and the right book (21). I would also argue they need time, since many do not have the luxury of a quiet place for an extended time in their home life. 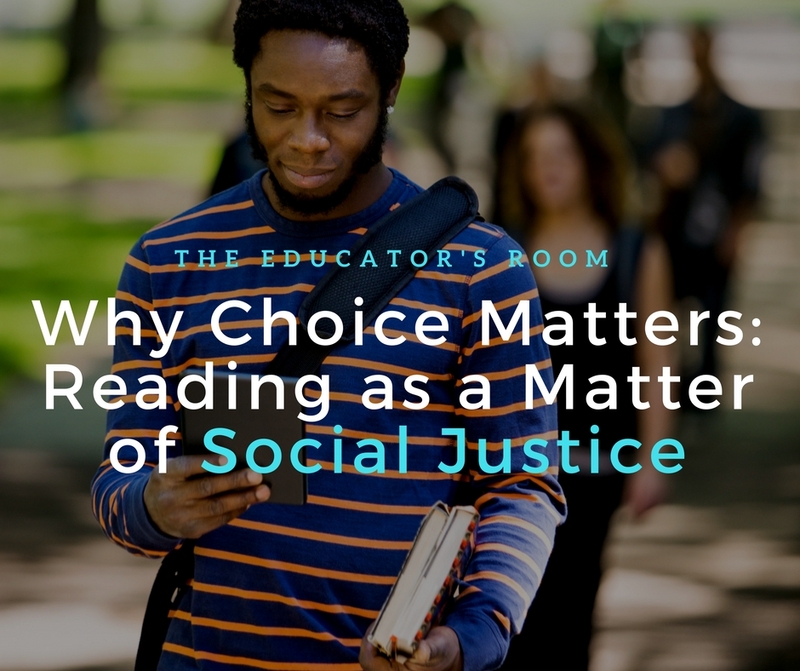 When we, as teachers, choose every text a student needs to read, we marginalize student experiences and belittle their own ability to choose something that would be of value. I know when what I read is chosen for me, I am more likely to procrastinate and it takes me much longer to get into it, and I’m an able avid reader! Can you imagine if you can barely read Shakespeare and you are assigned large chunks to read and comprehend by yourself rather than to settle in with something you chose? I’m not saying we abandon full-class texts entirely, but it is imperative that if we want to build literate, lifelong readers, we give our students choice as well. As a final thought, I wanted to share this video that was recently released by Project Literacy. I believe it does an excellent job visually representing why reading is indeed a social justice issue.